Wynn, Graeme. "Timber Trade History". The Canadian Encyclopedia, 06 April 2017, Historica Canada. 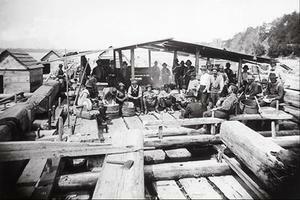 https://www.thecanadianencyclopedia.ca/en/article/timber-trade-history. Accessed 18 April 2019. 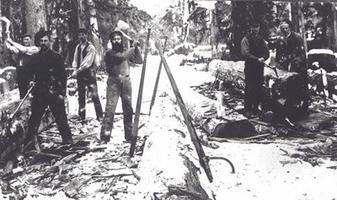 Boom men at O'Brien logging camp on the shores of Gordon Pasha Lakes use pike poles to manoeuvre logs to still water. A railway line then carries them four miles to the coast of Powell River, BC (courtesy Library and Archives Canada/C-79019). 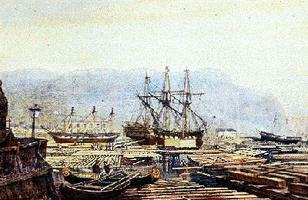 Until the 1870s the timber booms gathered for export at Québec were the source of much of the wealth of Canada (courtesy John Ross Robertson Coll, Metropolitan Toronto Library). Ottawa, around 1880. Timber was moved down the Ottawa and on to Quebec City via these rafts (photo by W.J. Topely, courtesy Library and Archives Canada/PA-840). 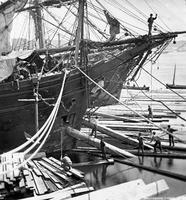 Loading ship with square timbers, Quebec City, Que, 1872 (photo by William Notman, courtesy McCord Museum/I-76319.2). Wood was the staple of Canadian trade for much of the 19th century. Fueled by European demand, the timber trade brought investment and immigration to eastern Canada, fostered economic development, and transformed the regional environment far more radically than the earlier exploitation of fish and fur. It encouraged exploration, the building of towns and villages, and the opening of roads. While a great resource for Canada, timber also contributed at times to economic instability. Over the course of the industry’s history, weather conditions, commercial uncertainties and imperfect market intelligence produced wide fluctuations in the demand for—and the price of—wood. 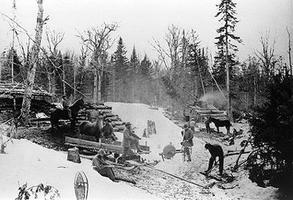 Logging was essentially a winter occupation, beginning with the first snowfall. Not only did cheap labour abound during this season, but it was easier to fell trees when the sap was not running, as well as drag the logs through the snow. In the fall, loggers would build camps (see shanty) and clear rough roads for hauling hay and provisions, and for moving logs or timber to the streams. 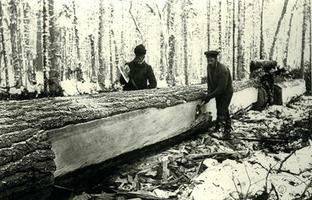 The industry depended heavily on the muscles of men and beasts, as manual logging techniques were used until about 1912. Originally, men enlisted the help of oxen, later switching to horses and continuing with their use until the 1920s. By far the most important innovation was the steam-powered donkey engine, introduced in about 1897 from the US, which could drag logs up to 150 m. Another innovation was the "high lead system," in which a line high over the skids pulled or lifted the logs over obstacles. 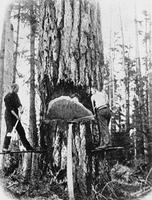 Trees were normally felled with various types of timber axes (until the 1870s, when the crosscut saw became more common), and "bucked” (i.e., sawed) to stick length. Timber was squared by axemen, because square logs were easier than round logs to store and transport on Europe-bound ships. The process of squaring a log began by “lining” the wood along two sides to mark the dimensions of the desired square, and then “scoring" to remove the unwanted outside wood in rough slabs. From there, the sides of the log were rough-hewn (i.e., coarsely chopped) and then smooth-hewn using broadaxes. The process was then repeated with the remaining two sides of the wood. Before transportation, the ends of the stick were trimmed to a pyramid shape. A snow road eased the hauling of logs and baulks to riverbanks by oxen or horses. With the coming of the thaw, the timber drive began. Men equipped with "jam dogs" (iron hooks), cant hooks or peaveys, and often immersed in chilly water, began the dangerous task of floating the cut-out on streams overflowing with melted snow. When more open water was reached, or where falls and rapids could be bypassed by timber slides, logs and timber were assembled into RAFTS to continue downstream to mills or to river-mouth booms (especially at Québec, Saint John and the mouth of the Miramichi River), from where they were shipped abroad. As steam power replaced water power in sawmills, it increased mill capacity and extended the season of mill operation; however, it did not break the pattern of winter logging. 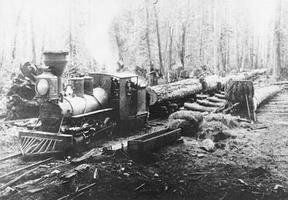 Although railways reduced the industry's dependence on rivers to transport timber to the mills, their initial importance was in carrying lumber from mill to market, and by the end of the century, specialized logging railways still only had a slight impact on eastern Canadian operations. 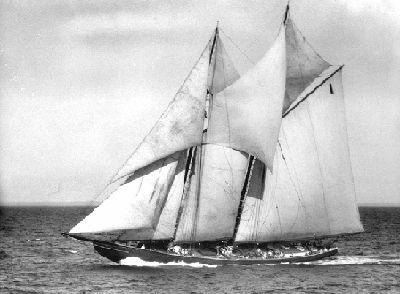 Large masts, cut for the Royal Navy from the finest trees of the mixed forest that swept through the Maritimes and the St Lawrence Valley, were the most valuable commercial product of British North American forests. The naval mast trade, always limited by its specialized and high quality requirements, shifted from the Saint John to the St Lawrence Valley early in the 19th century when contractors sought oak, as well as pine, from the deciduous forests of the southern Great Lakes area. The square timber industry developed rapidly to meet the enormous demand from Britain, which was at war with Napoleonic France and was also undergoing industrialization. In 1806, in an effort to strangle Britain’s economy, Napoleon established the Continental Blockade, closing all European ports to British ships. 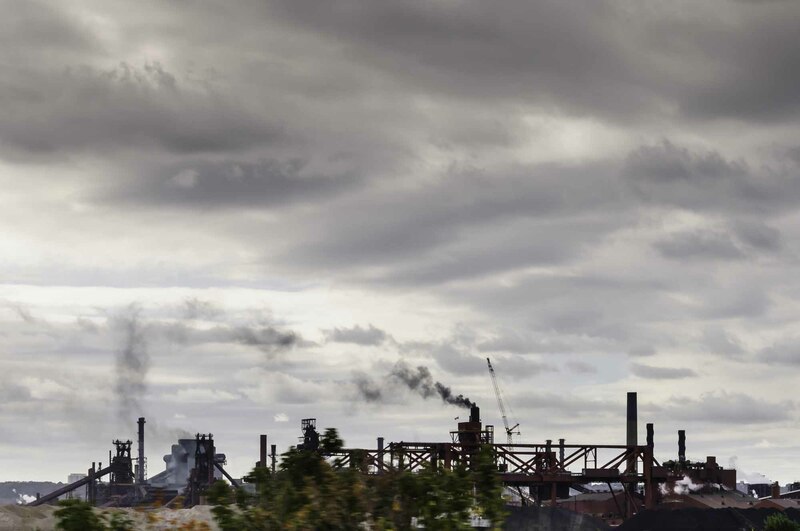 Because Britain’s traditional source of timber, the Baltic, was not accessible during this time, the Blockade further fuelled the British North American industry. On average, 9,000 loads (almost 1.5 m3 each) of colonial timber entered Britain annually between 1802 and 1805, and that number only continued to grow: In 1807 the total was 27,000; in 1809, 90,000; in 1840 over 500,000; and in 1846, 750,000. Thereafter imports fluctuated for 20 years around 600,000 loads and then declined until WWI. Despite the importance of the naval mast trade, sawn lumber and square timber were the major staples of the wood industry. Lumber, the product of sawmills, was prepared mostly as planks and boards. Square timber—known in the Maritimes as "ton timber”—were baulks or "sticks" of wood hewn square with axes and shipped to England, where they were often resawn. Strict specifications governed the market—the wood was allowed to have a "wane" (bevel) and slight taper, but these specifications varied according to the stick's dimensions and changed with time. Waste was quite considerable: 25-30 per cent of each tree was discarded. The pattern of the lumber trade is hard to summarize, since international markets were widely separated. Beginning in the 1830s, increasing quantities of lumber were shipped from British North America to Britain, the US and the West Indies. During the period of reciprocity with the US and the construction of railways and canals, the importance of the American market grew: 400 million board feet of British North American lumber passed through Oswego, NY, between 1864 and 1866, and wood exports to the US from the Province of Canada were worth almost $7 million in 1866-67. While these numbers are impressive, up until the 1880s combined lumber and timber sales to Britain were still more valuable than those to the US. It was not until 1905, with imports of some $18 million, that the US accounted for more than half of Canadian forest-product exports. Pine was the industry's major species, although small quantities of birch, white oak, rock elm, ash, basswood, butternut and cedar were also cut and squared, and spruce and hemlock lumber increased in importance after the mid-century. The exploitation of pine rapidly encompassed a wide area. In 1810 only the fringes of New Brunswick's pine forests had been cut, and the Ottawa-Gatineau area marked the inland limit of lumbering in British North America. But by 1835, barely a tributary of the Miramichi, Saint John and Ottawa rivers remained unexploited. By 1850 much of the pine had been harvested from the more accessible reaches of these river systems, and trade from many small ports and coastal inlets had ceased. Railways broke the industry's dependence on water courses for the movement of wood to markets and opened the back-country of lakes Ontario and Erie to the trade. Exports from the Peterborough area increased fivefold when the railway arrived in 1854, and between 1851 and 1861, Simcoe County rose from insignificance to pre-eminence among lumber producers in Canada West. Mills proliferated along railways pushing northward into the Canadian Shield. The government was slow to control this onslaught on the forest. Initially British North American forests were ineffectively protected by the imperial "broad arrow" system, which involved blazing certain trees with arrows and which was implemented in North America early in the 18th century to reserve valuable trees for the Royal Navy. As demand rose after 1806, crown reserves (i.e., land belonging to Britain) were violated, and the surveyors appointed to protect them profited from the administrative confusion. In 1824 in New Brunswick and 1826 in Upper and Lower Canada, a coherent regulatory system was established. In British North American provinces except Nova Scotia, the sale of licences conferred a temporary right to cut trees and returned revenue to the government. Periodic amendments attempted to limit the illegal cutting and trespassing which vexed administrators intent on maximizing revenues, but the basic principles of crown ownership and leasehold tenure of the resource were upheld. In marked contrast to the American pattern, present-day Canadian forest law (with the exception of that in Nova Scotia)—shaped by the interplay of tradition, self-interest and the limitations of a vast and hostile environment—has preserved something of the 18th-century conservative idea of how the state should serve the common good. Before 1825, most British North American timber was produced by small-scale independent operators, many of them farmers who were attracted to the work in their off-season. Good timber was readily available and little capital was required to enter the trade. By 1850, however, as lumbering moved into more remote areas, expenditure on the clearing of boulder-strewn streams (to transport the timber via the water) became necessary. Regulation of crown reserves tightened, and the declining trade intensified competition among operators. Large and diversified operations emerged, although smaller enterprises persisted on the settlement frontiers. Generally the skilled, the well capitalized, and the well-connected dominated the trade by acquiring licences, employing lumbering gangs under contract, building large, efficient sawmills, and operating their own vessels or railways. For example, in the 1840s Joseph Cunard and three branch houses of the great Scottish firm of Pollok, Gilmour and Co virtually controlled the trade of northeastern New Brunswick by these means. Subsidiaries of the company were also important in the St Lawrence Valley. William Price, "le père du Saguenay," was said to employ 1000 men in the 1830s, and by 1842 he had sawmills at Chicoutimi and a steam tug to take ships up from the St Lawrence. In the Ottawa country, J.R. Booth's firm produced over 30 million board feet of pine lumber in the 1870s, and in the next decade it built the Canada Atlantic Railway to bring out the cut from its Parry Sound licences. In Canada West the firms of Mossom Boyd and D.D. Calvin experienced similarly spectacular successes. The early, informal trade gave way to an industry dominated by relatively few well-capitalized family firms and partnerships. For this reason, the chronic instability of the early years was somewhat reduced. In the 20th century, as pulp and paper production grew, capital requirements increased further. 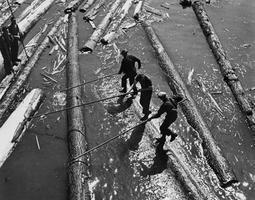 Many firms amalgamated, shaping the patterns of corporate dominance that mark the forest industry today. Compared to the situation in eastern Canada, innovations were accepted more quickly in the rugged, newly opened areas of British Columbia. 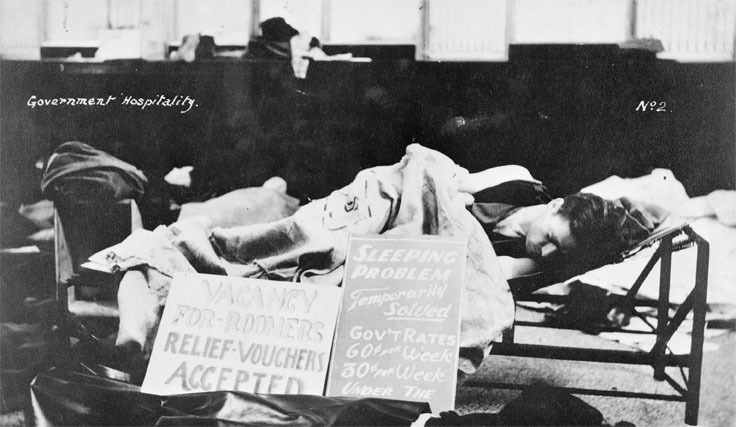 Working and living conditions improved as city industries and West Coast logging camps competed for labour. These changes, when combined with the opening of the Panama Canal and the exhaustion of eastern forests, meant the centre of Canadian wood production gradually shifted westward (though the eastern lumber industry retained much of its traditional and seasonal character into the 1930s). Although James Cook's men had cut logs for masts on Vancouver Island in 1778, lumbering in British Columbia did not begin seriously until the 1850s. The early industry exploited the huge trees close to the tidewater (mainly Douglas Fir and red cedar) and served markets scattered around the Pacific and as distant as South Africa. With the completion of the Canadian Pacific Railway in the 1880s, this "cargo trade" was supplemented by trade to the east. Soon, British Columbia wood was popular worldwide. Lumbering on the rugged West Coast required considerable adaptation of eastern techniques: three times as many oxen were required; snow roads were impossible in the milder coastal climate (so skid roads had to be built of logs); cuts were made higher on the huge trunks (meaning a springboard was required for each of the two axemen to stand on); and heavy, double-bitted axes were developed. In 1910, British Columbia production surpassed Québec's. In 1917 it surpassed the production of every other province, and by the late 1920s British Columbia was producing half of Canada's annual cut of timber. As in the East, railways as well as waterways brought timber to mills or ports. Today, the industry primarily uses trucks. Forestry is still a vital part of Canada's export base. See also Forest economics. E. Gould, Logging (1976); M. Allerdale Grainger, Woodsmen of the West (1964); A.R.M. Lower, The North American Assault on the Canadian Forest (1938); D. MacKay, The Lumberjacks (1978); Graeme Wynn, Timber Colony (1981).